It’s plastic where it shouldn’t be. It’s in the sea and on the beach and it’s causing harm. We’re using more plastic than ever, it’s durable, cheap to produce and we’re consuming it at staggering rates. Current estimates show that at last 8 million pieces of plastic are entering the oceans every single day. How does it get in the sea? Two-thirds of it comes straight from land based sources: litter being left on the beach or washed down rivers and drains from litter being dropped in towns and cities. It comes from industry spills, badly managed landfill sites and bins near the coast or by being flushed down the loo. The remainder is lost at sea such as containers going overboard or lost fishing gear. How much plastic pollution is there? Approximately 51 trillion microscopic pieces of plastic, weighing 269,000 tons. That is about the same as 1345 adult blue whales. And 500 times the number of stars in our galaxy. I know which I would rather see. As we know, plastic is strong, flexible and durable making it extremely useful, however that also means it never really breaks down. A plastic bottle can last for 450 years in the marine environment, slowly fragmenting into smaller and smaller pieces which eventually end up microscopic but never truly go away. This means that every piece of plastic that has ever been produced is still with us, in some form. Yuck! What harm does plastic pollution do to the environment? For wildlife such as fish, dolphins, seabirds and seals it can be deadly as they become entangled or mistake it for food. Images from the Midway Atoll have illustrated this problem to shocking effect when photographer Chris Jordan captured the remains of albatross, stomachs full of plastic pieces because they accidentally made a meal from our discarded waste. More recently a Cuvier’s beaked whale was found malnourished and dying off the coast of Norway. Experts had to put the animal down as it was in such poor condition and the autopsy showed a terrifying 30 plasic bags and a large amount of plastic packaging with labels in Danish and English in its stomach and intestines, causing bloackages and pain. It doesn’t affect me directly though does it? With 1 in 3 fish caught for human consumption now containing plastic, the question is no longer are we eating plastic but how bad for us is that? In seawater plastic absorbs chemicals like PCB’s and DDT’s which have been linked to endocrine disruption and even some cancers, becoming more powerful as they work their way up the food chain. The beach is where we go to connect with nature and put simply, it’s not the same if it’s covered in plastic. Some of us rely on it being clean for our livelihoods with coastal tourism being worth £5.5 billion to the UK economy. Even if we don’t eat fish, or even go to the beach, all of us without doubt, breathe! And all that delicious oxygen? 70% of it is produced by marine plants, so we need to take care of it! Can’t we scoop it all out of the sea? Nice idea, but sadly impossible. For a start, only 1% of marine litter floats, with the vast majority sinking to the sea floor. Even if we tried to ‘scoop’ up that 1%, in international waters who would pay for it? To further complicate matters, the majority of it is microscopic. There is no ‘away’ because even if miraculously we managed to get all of these pieces, most smaller than a grain of rice out of the sea, what would we do with it then? All we can do is stop using more. In the North Pacific, a gyre or slowly swirling whirpool of ocean currents collects plastic debris. It is estimated to be twice the size of France and Charles Moore, the oceanographer who discovered it has predicted that it will double in size in the next 10 years if we don’t change our ways. It is not exactly a nice neat island that we can tidy away, it’s more like a ginormous plastic soup made of confetti like fragments of plastic. It has been imagined that it would take 67 ships 1 year to clean up less than 1% of the Great Pacific Garbage Patch. Plastic isn’t all bad is it? No, it can be incredibly useful. Diabetics use it for their disposable syringes; arthritic patients have it for their replaced hips; and construction workers wear it to protect their heads. Without it we wouldn’t have computers, mobile phones or cars. Essentially, it is vital. The big problem is single use plastics and the quantities in which they are used. A plastic bag for instance is used on average for 15 minutes, yet could take 100 – 300 years to fragment. Plastic pollution can now be found on every beach in the world, from busy tourist beaches to uninhabited, tropical islands nowhere is safe. Scientists have recently discovered microplastics embedded deep in the Arctic ice. 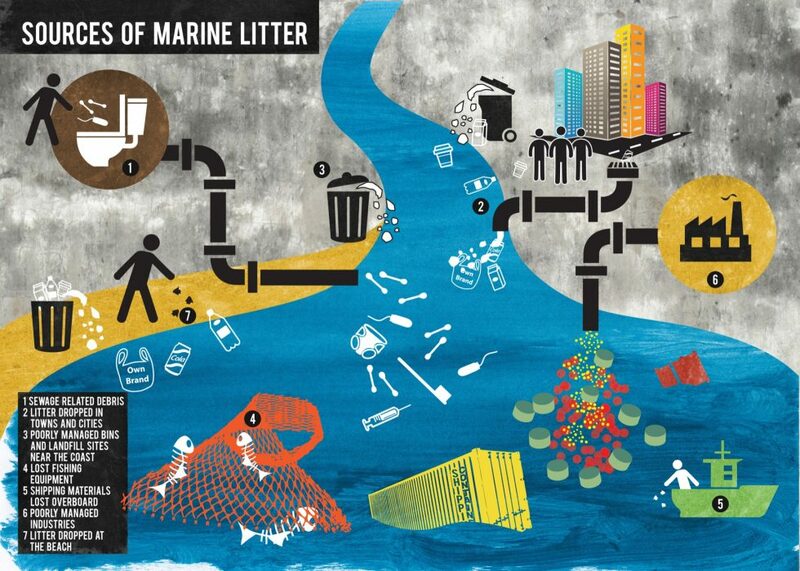 Plastics consistently make up 60 to 90% of all marine debris studied. Approx 5,000 items of marine plastic pollution have been found per mile of beach in the UK. Recent studies have revealed marine plastic pollution in 100% of marine turtles, 59% of whales, 36% of seals and 40% of seabird species examined. 100,000 marine mammals and turtles and 1 million sea birds are killed by marine plastic pollution annually. What is a Deposit Return Scheme (DRS)? Imagine it this way – you’re buying the contents, but renting the container. Remember milkmen? That’s the idea, with plastic, glass and metal drinks containers. So, you buy your usual fizzy drink and it’s 10-20p more expensive than it was before, but when you take the bottle back to the retailer and post it into the ‘reverse vending machine’ you’ll get your deposit back. In the UK, we are using 38.5 million plastic bottles every single day and struggling to recycle half of those. We’re convinced a DRS will become the next ‘plastic bag charge’ and we’ll look back and wonder why we didn’t do it sooner. Does a Deposit Return Scheme actually work though? Sure does! In fact, we used to have one in the UK until the 1980s when glass containers were replaced by their cheaper plastic alternatives. In Europe: Germany, Belgium, Croatia, Sweden, Finland, Estonia, Hungary, Iceland, the Netherlands, Norway and Denmark all have Deposit Return Schemes in place. In fact, in Norway they manage to capture 96% of their single-use plastic bottles, keeping the high quality plastic material in the loop, making it much easier to recycle into new products, meaning less need for new plastic bottles to be created. Win-win!